Australian Synchrotron infrared scientists Mark Tobin and Ljiljana Puskar have returned from France with newly acquired skills which will allow the study of materials under extreme pressure conditions using diamond anvil cells. Their work alongside French colleagues Jean-Paul Itié and Paul Dumas at the Soleil Synchrotron in Paris in May 2009 is part of efforts to broaden Australia’s infrared spectroscopy expertise in this area of research. Enhancing the technical capabilities of the Australian Synchrotron’s IR beamline to study how different materials respond to elevated pressure will be of direct value to mineralogical and petrochemical industries and other sectors such as food technology, molecular biology and novel electronic materials. For example, investigating high-pressure conditions that could reduce or replace solvents and catalysts in some industrial processes is a fundamental part of ‘green chemistry’. High-pressure studies of mineral samples will help determine the characteristics and productive potential of mineral deposits, while studies of structural changes in proteins will benefit the food industry. The visit was made possible by an International Science Linkage grant awarded to the Australian Synchrotron’s infrared microspectroscopy team under the French Australian Science and Technology program (FAST) for 2009-2011. The grant will enable researchers from the Australian and Soleil synchrotrons to exchange expertise, and maintain the two synchrotrons as world leaders in infrared microspectroscopy. Soleil scientists will visit the Australian Synchrotron later this year. The FAST program is managed by the Australian Department of Innovation, Industry, Science and Research (DIISR) and the French ministries of Higher Education and Research (MESR) and Foreign and European Affairs (MAEE). 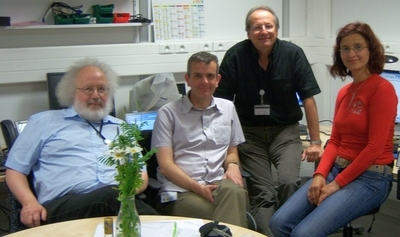 Click link below to see how this international collaboration was reported on the Synchrotron Soleil website. From left to right: J.P. Itie ( SOLEIL), Mark Tobin ( Australian Synchrotron), P. Dumas ( SOLEIL) and Ljiljana Puskar ( Australian Synchrotron) at the NICPLAN end station at SMIS.